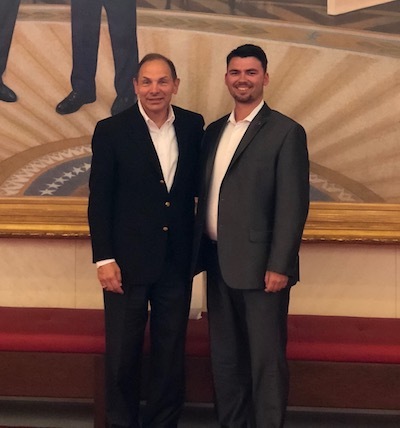 Two University of Southern Maine students — Omar Andrews and Camden Ege — graduated from a 15-hour leadership seminar hosted at Dallas’ George W. Bush Presidential Center. 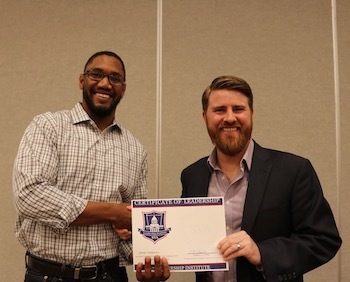 Andrews and Ege joined 91 other graduates from the Student Veterans of America’s 2017 Leadership Institute to meet with high profile mentors. The work was aimed at examining each student’s personal leadership ethos and how to apply it. Ege and Andrews, the president of Husky Vets, met with a variety of VIPs. Ege was photographed with Robert McDonald, the former VA secretary and CEO of Proctor & Gamble. Andrews was photographed with Jared Lyon, president & CEO of Student Veterans of America. All graduates were gathered for a photo with former President George W. Bush. To Ege, the seminar forced him to reflect on leadership in a new way.